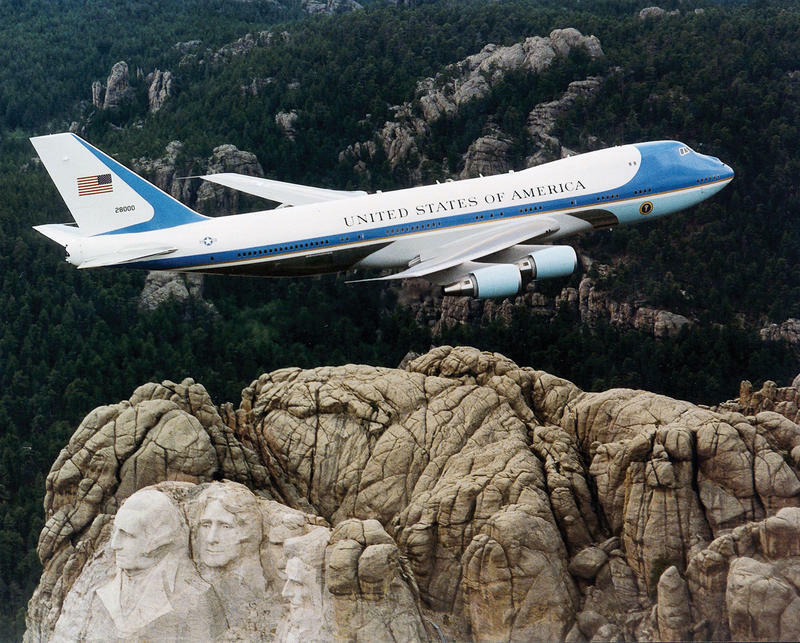 Air Force One, the typical air transport of the President of the United States of America, flying over Mount Rushmore. 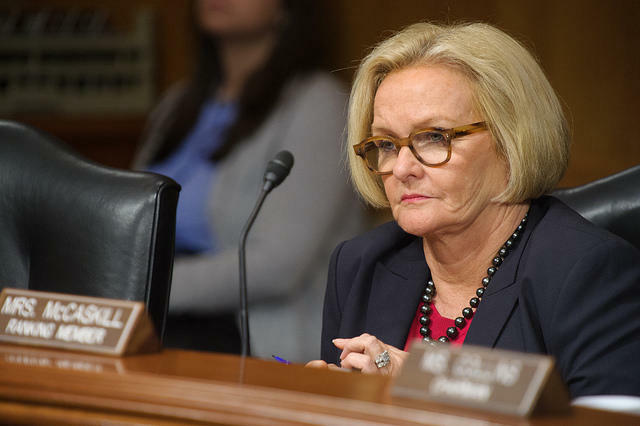 U.S. Sen. Claire McCaskill is continuing to hammer away at some GOP hints that Republicans might try to trim or privatize Medicare and Social Security. But on Tuesday, she also took on an issue closer to home – defending Boeing Co. from President-elect Donald Trump. Trump, a Republican, caused Boeing’s stock to briefly go into freefall Tuesday after he tweeted that he wanted to cancel the aircraft giant’s contract to build new Air Force One aircraft. Trump claimed the price was too high. U.S. Sen. Claire McCaskill, D-Mo. McCaskill joined others in noting that no order has been signed to build new Air Force Ones. Boeing Company, which has operations in St. Louis, only has a smaller $170 million contract to determine what new features are needed for new Air Force One planes. McCaskill noted that the current fleet of Air Force One aircraft, which transport the president, are more than 20 years old. Boeing has built every Air Force One since the early 1940s. Air Force One has special technology and communication features, but some defense experts say the current version of the plane -- which is supposed to be able to act as an in-the-air command center -- is behind the times. In a conference call with reporters, McCaskill said she is not sure where Trump got the $4 billion figure that he was touting. She acknowledged that the development and construction costs may end up being close to that, for two planes, but she emphasized the next version will likely not be airborne for seven or eight years. “When there are numbers available, I will join, at that time President Trump, in taking a close look to make sure the taxpayers are getting the best value possible for what is needed for the president,” the senator added. Late Tuesday, some news outlets speculated that Trump's tweet actually may have been in response to comments by Boeing CEO Dennis Muilenburg published Tuesday in the Chicago Tribune. Muilenburg was somewhat critical of Trump's anti-trade proposals, noting that Boeing does business with China. But Trump denied any link in a Wednesday interview with NBC's Today Show. He also disclosed that he had talked with Muilenburg since launching his tweet, and praised the CEO as “a very good man." McCaskill also said she has strong misgivings about Georgia congressman Tom Price, who has been tapped by Trump to be in charge of the federal Department of Health and Human Services. She pointed to Price’s longstanding calls for revamping or privatizing Medicare and Social Security. That's why she says Price's nomination is bad news for the nation's elderly. “That has been the crusade of his career, to tear up Medicare,” McCaskill said. The senator said she expected Senate Democrats to unite against Price. But she acknowledged that he'll need only 51 votes to be confirmed. The Senate chamber has 52 Republicans, but McCaskill hinted that some – especially those up for re-election in 2018 – may side with Democrats. Until Democrats changed Senate rules a few years ago, it could take 60 votes to break a filibuster over a presidential Cabinet nominee. McCaskill said she did not regret that move, adding that she believed that a president should have broad leeway on who is chosen for his or her Cabinet. For example, she implied that she wasn’t going to automatically oppose Trump’s decision to nominate retired Marine Gen. James Mattis for secretary of defense, a post traditionally (but not always) held by a civilian. That said, she asserted that Price was a step too far. The broader issue, McCaskill added, is whether President-elect Donald Trump plans to attack Medicare as well. Boeing’s new facility will start production of composite parts for the 777X commercial jet in January. The company held a ribbon cutting for a new 424,000-square-foot plant on Thursday. 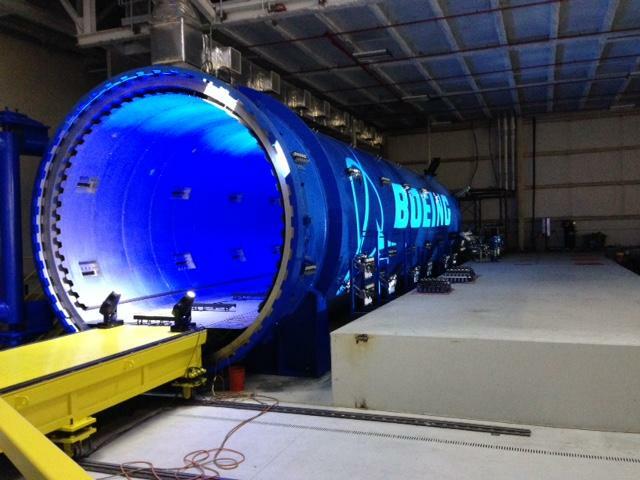 Eventually Boeing expects to hire about 700 employees for production on the 777X in St. Louis.